While it may seem counterintuitive to turn off notifications within Windows, once you have used Windows 10 for a while, you will likely want to do it. For some reason, Windows 10 has more trouble with the various USB devices than other versions. My installs are constantly flagging issues with USB so I turn notifications off. 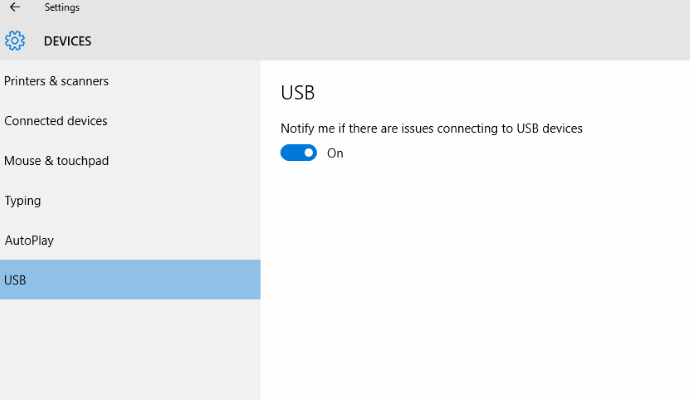 If you want to know how to turn USB notifications on or off in Windows 10 too, this is for you. There are two main ways of turning off those USB notifications, via a registry entry or in Settings. Both achieve the same result, so use whichever setting you’re most comfortable with. 3. Modify ‘NotifyOnUsbErrors’ to ‘0’ to turn off and ‘1’ to turn on. You can also change the notification within the settings menu. 1. Navigate to Settings within Windows 10. 2. Select Devices and then USB. 3. Toggle the setting on the right on or off to change notifications. Once you modify the settings, you should no longer receive any notifications about issues with any USB drive. If, in the unlikely event you find you miss the notifications, just reverse the changes you made. Change the 0 to 1 in the registry or toggle the switch back on in settings. They both do exactly the same thing. Question Taskbar notifications - turn off? I am getting "your windows will expire soon" notification, but when did i activate it?